Tip 49: Never, Ever Wear a Plain T-Shirt | Weird! Why Aren't You Vegan? In the animal rights world, we often discuss and dispute effectiveness. We read and talk about which methods of activism and persuasion work best–leafleting, online advertising, wearing shirts… the usual. In that vein, I recently conducted a game-changing study, the results of which I think should drive all our actions from now on. We now know definitively* that the best form of activism is wearing a shirt with an animal rights message on it. So, you want to finally start helping animals in a meaningful way, huh? It’s incredibly important to wear your heart (or your peace sign, or your “V” with the leaf on it) on your sleeve. 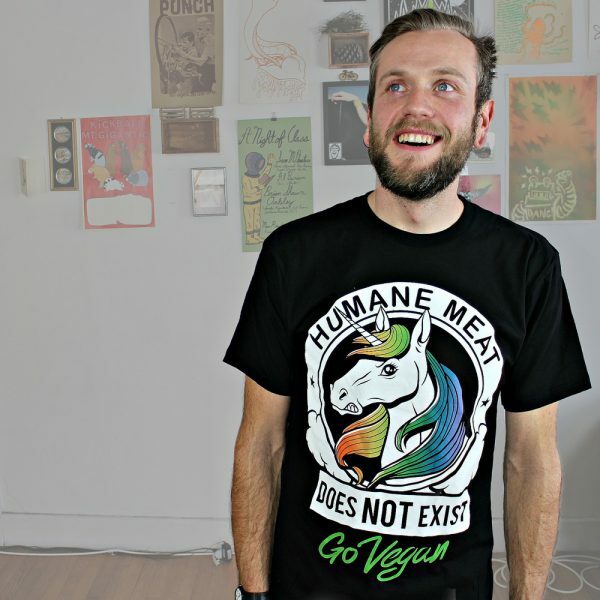 Research the various companies that sell shirts with animal rights messaging on them. There are lots, so choose your favorite. If it’s not Compassion Co. pick again. You do want to help animals, don’t you? Select the seven shirts you like best, one for each day of the week. They can be t-shirts, sweatshirts, anything. As long as they’re made by Compassion Co. I’m serious. Pick three more shirts to wear to the gym each week. Or four more if you’re an annoying showoff. If you need more than four gym shirts per week, unfriend me on Facebook please because I hate you. Use the last bit of money in your poor activist bank account to buy the shirts. Give away your plain shirts to some plain-brain who doesn’t care about animals or civic duty. Or keep them to use as rags and sop up Bragg’s Liquid Aminos spills in the kitchen. No matter how much activism your friends do, you’ll always win because you’re advocating for animals all the time, just by wearing clothes. Shirts with words make for more interesting Facebook profile pics. And bonus! Round-the-clock online activism! Even more winning. Fitting in at black tie affairs. Thinking there’s a cool guy reading your shirt and reconsidering his beliefs and behaviors, then finding out he was just a creepy pervert staring at your chest. Now, head on over to Compassion Co. and stock up on activism tools! *Nope. I made it up. **Completely fabricated. Fabricated! Get it? Fabric!